I’ve left it a while since writing a blog post! Sorry the PhD took over my life for a while there (a bit more than usual!). So what have I been doing? Well there has been some more data collecting, more writing, more hockey and the upgrade. For those of you who don’t know about the PhD process some universities conduct upgrades during the PhD. This is an examination type meeting where a couple of lecturers (most likely within the same department as you) question the PhD student on a piece of written work and assess whether they a) have a project that can stand and process onto a PhD and 2) that the student knows what they are doing?! To be honest mine feels like a bit of a blur and it is quite an odd experience! However, I came through it and received some great advice that I will be using to refine, restructure and focus my project. I’m hoping that I’ll continue my PhD with a slightly new perspective and with the knowledge that it is going well (although I will have to remind my self that constantly. It’s the nature of the beast!). Please note that for each university this process is different and has different requirements. When I talk about my upgrade it only relates to my experience. I highly recommend attending any training events relating to the upgrade and/or talk to your supervisors and fellow students who have gone through it. I was told that this is to help prepare you for the final viva so it is going to be tough – but worth it in the end! So what else have I been doing? Well more data collection for a start. I’ve visited a couple more museums including Cheltenham Museum and a small collection held by the University of Bristol Spelaeologial Society (which also hosts the brilliant cave Gazetteers website that I mention on my British Osteologial Collections page). But I guess the one I would like to brag about is the Natural History Museum! Yup I was lucky enough to carry out a weeks data collection at the NHM London. The NHM is one of my favourite museums, I went there a number of times and now that I live near London I can go as often as I like. But it was such a great opportunity to go and use some of their collection in my research. The lovely Curatorial Assistant was on hand to help with any questions and queries and it was great getting to chat to her. I hope to see her again at BABAO 2017 where we both hope to present a poster. It was a privilege to work there and can even say that I met the curator of the human remains collections (who was also our first key note speaker at our SSSB conference – see previous post). In addition, as part of the agreement to collect data I carried out some basic osteological curation work on the specimens I examined by completing an inventory sheet of the remains. It may sound like a small thing but it will allow for easier and more efficient inventorying and assessment for future researches and curators – and hey every little helps! What else is there…Oh yeah I’ve just come off from two excellent training days organised by the Collaborative Doctoral Partnership (CDP), who fund my PhD. These two days talked about life after the PhD, getting and applying for funding grants and things to consider when applying for jobs. Even though I am only in my 2nd year to was a great thing to attend. It means I can start thinking about what I want to do now, and start preparing my CV, skills and research so I can look for work/funding efficiently and productively when the time comes. It was also great to meet some of the other CDP students, it’s always nice to hear about their experiences and learn about their research. Through this I was asked if I would like to do a small presentation about object handling at another CDP event coming up in a few weeks (check out those networking skills lol!). They haven’t got anyone talking about human remains so I think I will take them up on their offer. Plus it will give me another chance to practice my presentation skills! I’ll report back in a few weeks to let you know how it went! Anyway, I hope this gives you a little idea of what I’ve been up to. Next week I’m away in Barcelona (it’s the boyfriend’s birthday treat) and will come back refreshed and relaxed ready to hit the ground running with the PhD. Until then…adios! A Night In An Old Operating Theatre! This week has been a long one! I’m not sure why as it’s been pretty good and quite productive but it’s taken a while to get through. Maybe it’s because I’ve been travelling for my data collection again and I’m not used to driving so much?! As well as my PhD work this week I went to a really cool talk about Bodysnatching in an old operating theatre – perfect for Halloween! On Monday I was back at the stores of the Hampshire Cultural Trust to finish going through the various sites they have. I’m pretty pleased with myself as I’ve managed to get through a lot of skeletons in a decent amount of time. There are two small sites to work through but as they’ll only take me half a day at most I will return another time. At some point in the future I will need to go to their other store to access a Romano-British population. On Wednesday I was then back at the stores of Corinium Museum in Cirencester. Although it’s a bit of a journey to get there my mum lives about half an hour away so I went up the night before. This cuts my travel time down in the morning and I get the bonus of seeing my mum. I’m really lucky as I have a great relationship with Mum so it’s always lovely to go back home. Whilst at the Corinium stores I managed to get a decent amount of work done. However, the Anglo-Saxon collection I’m looking at is quite big. This is good news as it’ll be a great source of data for my PhD but on the other hand it will take me some time to complete it. Unfortunately I can’t do a series of consecutive days at the stores as it is only staffed one day a week, but I then get to visit my mum quite a bit so it’s not all bad! This weeks blog post ends with a trip to the Old Operating Theatre in London to see a lecture. The talk is called ‘Night of the Bodysnatcher’. The Old Operating Theatre is a museum located in the roof space of St. Thomas’s, Southwark just around the corner from London Bridge train station. This is the original site of St Thomas’s hospital and is one of the oldest surviving operating theatres. It is quite an odd place, to access it you have to climb a tight, spiral staircase that leads to a tiny museum displaying some of the instruments and medical equipment used in the past. Going through the museum and around a corner you find the old operating theatre, pictured in the image above. This is where we sat and listened to the talk, but it was strange to think that’s where dissections and operations took place many years ago. The talk itself was very interesting, I do love learning about the history of surgery and the things surrounding it! This talk was, as the title suggests, about Bodysnatchers or otherwise known as Resurrection Men. These were individuals who took the bodies of the recent dead from their graves and sold them to surgeons, who then used them for dissections to learn about anatomy. It may have been quite a gross job to do, but it could be rather lucrative for a period in the 1700s as surgeons wanted bodies and would therefore pay! A view of the museum at the Old Operating Theatre, and a replica beak mask. There were lots of great facts and fascinating bits of information, for example, did you know that the body snatchers stripped the body of corpses of their clothes and possessions and placed them back in the grave? Why – because you could be hung for theft by taking the clothes, as they belonged to the relatives of the deceased, but not for taking the body! It was an incredible insight into the very seedy past of the study of anatomy, and although it was gruesome it allowed many to study the human body. Perhaps without the Bodysnatchers surgery wouldn’t be where it is today! For example, some of the famous early surgeons in the UK, including William and John Hunter, almost certainly would have used snatched bodies in their work! I very much enjoyed both the talk and museum and I would highly recommend visiting! After a week off due to moving house I’m back at the College where I’m starting on a new project. This time I will be working with a collection of infant teeth. As with the previous protects I’m creating an inventory of the collection by taking photographs of the specimens and the associated paperwork. This information will then be uploaded and added to the museums database. The collection includes the teeth of fetal or neonatal individuals. Each set of teeth have some personal information associated with them making it a very sensitive collection. I’m not sure why such a collection war created but it has a very high potential for research due to the quality of the specimens and it’s data. When I first started my course looking at human remains at university I was never a huge fan of teeth. However, as time has gone on I’ve become more familiar with teeth and their uses in research. If you know how to use them teeth can tell you a lot including the age and diet of an individual. During this project I hope to learn even more about teeth and what information they can provide. 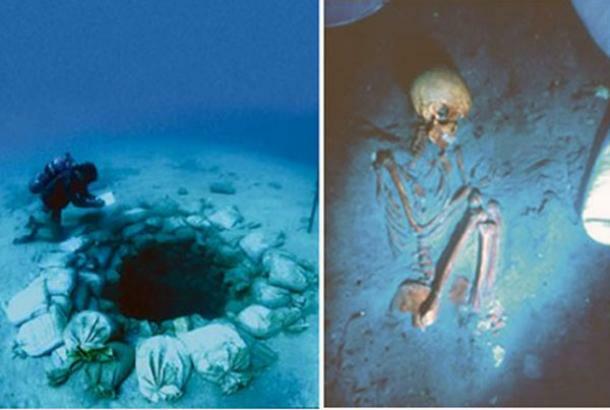 Well and human remains excavated at Megalithic site. Image taken from article. I originally saw this article through Facebook when it was posted by Powered by Osteons. After a read through the article I thought it was worth sharing. A settlement dating to the 7th millennium BC has been excavated off the coast near Israel. This site was first discovered in 1984 by marine biologist Ehud Galili. Excavation of this site have revealed houses, a well, stone paved areas and stones walls. In addition to these more usual finds a megalithic structure was also identified. There are 7 of these megalithic measuring up to just over 2 metres surrounding a fresh water well. As well as the impressive megalithic a many floral and fauna remains were found, including human remains. There were a total of 65 individuals found at the site, with some identifies as having been buried in graves. It has also been noted that two cases of tuberculosis (TB) were discovered in the skeletons of a women and child. As if this was not compelling enough it was identified that these were the earliest cases of TB. There are references to the original papers at the end of the article. It’s impressive what can be found underwater and expect that in the near future we will hear more from this area of work. As technology improves I am sure that archaeological and historical digs will become easier underwater, revealing new worlds and past civilisations – and I cannot wait! It’s that time again, I’ve been at the College again today which means I’ve been sorting through boxes of bones. This week consisted of a lot of vertebrae in varying conditions. Each week we seem to have boxes that consist of predominately one skeletal element. It’s good in some ways – we get to grips with a particular bone each week which really helps me remember the anatomy of each bone. The downside is that it can get a little tedious and we then start to look forward to opening a next bone which consists different bones – just so there’s a bit of variation! There wasn’t any particular bone or featured that stood out this week. We had a few pathologies, mainly on the vertebrae. The most interesting pathology we saw involved three thoracic vertebrae which were fused together. This isn’t so unusual in itself but more that fact that there were only two spinous processes. 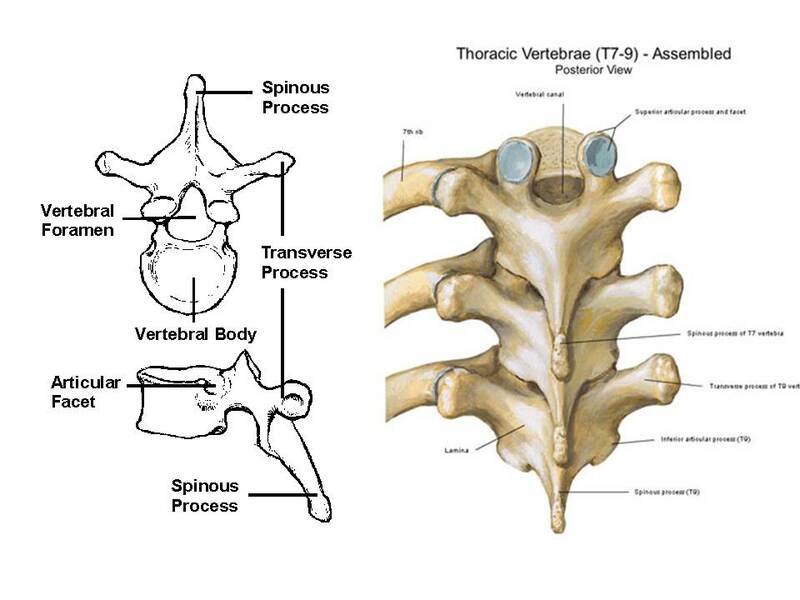 Below I’ve included an image of a normal vertebrae and you can clearly see each vertebrae has one spinous process. I’m not sure what was going on with the specimen we had today but it was clear than some fusing had taken place! Unfortunately I am not allowed to taken my own photos of the bones to show you due to ethical reasons. The only unusual thing we found today consisted of a bit of pig bone. When we pulled it out of the box we were pretty sure that it wasn’t from a human but had no idea what it belonged to. I took it to the curator, who also studied animal bones at university as well as human, and she said that it was probably pig. Both me as the other volunteer felt pleased with ourselves – at least we had identified it correctly as a non-human bone! Another week gone and I still enjoy looking at bones! I’m so glad to be given the opportunity to refresh my knowledge of bones again. I’ll need it too as next week is the other volunteer’s last week for a couple of months (she’s off on a dig in the north of England for 2 months). This means I’ll be on my own. I’m sure I’ll be fine but I’ll miss having that second opinion there. I guess it’ll push me out of my comfort zone – especially when it come to the bones of the hand and feet! It’ll make me trust in my own opinion too, which isn’t a bad thing as I have a tendency to doubt myself. But that’s not for another week! Until then I will enjoy the company of the other volunteer and playing with yet more bones!